Inventory We are a resale marketplace, not a box office or venue. Ticket prices may exceed face value. This site is not owned by Gillette Stadium . Gillette Stadium is a multi-purpose stadium located in Foxborough, Massachusetts, located 21 miles southwest of downtown Boston and 20 miles from downtown Providence, Rhode Island that serves as the home stadium and administrative offices for the New England Patriots football team and the New England Revolution soccer team. The facility opened in 2002, replacing Foxboro Stadium. The seating capacity is 68,756, including 6,000 club seats and 87 luxury suites. The stadium is owned and operated by Kraft Sports Group, a subsidiary of The Kraft Group, the company through which businessman Robert Kraft owns the Patriots and Revolution. The stadium was originally known as CMGI Field before the naming rights were bought by Gillette after the "dot-com" bust. Although Gillette has since been acquired by Procter and Gamble, the stadium retains the Gillette name because P and G has continued to use the Gillette brand name. Gillette and the Patriots jointly announced in September 2010 that their partnership, which includes naming rights to the stadium, will extend through the 2031 season. Additionally, uBid (until April 2003 a wholly owned subsidiary of CMGI) as of 2009 continues to sponsor one of the main entrance gates to the stadium. 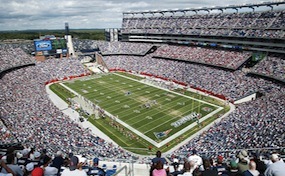 The Gillette.StadiumFoxboro.com is a privately held company that specializes in the sale of tickets in the secondary market. We are not affiliated with any official supplier or box office. To purchase tickets to any Gillette Stadium in Foxboro events simply call our operators at anytime or click on the event you wish to attend.